The designated nature reserve and national park of Las Salinas is located in Calpe close by to the other local Natural Park of the Penon de Ifach, the huge limestone outcrop that dominates the local skyline, and both are recommended tourist spots. 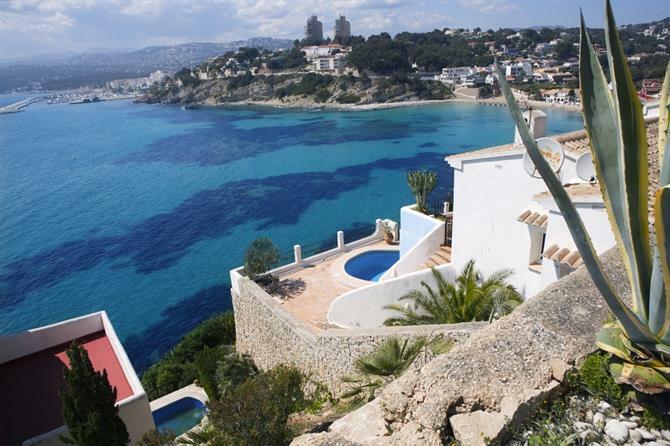 If you plan to rent a holiday apartment in Calpe, this wonderful place is very close to the town and is on the list of recommended “things to do” during anyone’s holiday in the area. 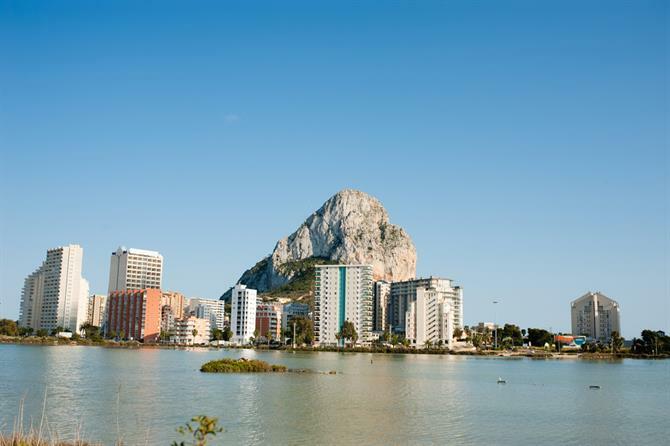 The local tourist office in the town has information on all attractions and places to go around Calpe and much more. The park is perhaps most famous for its colonies of flamingos. These lovely and majestic creatures attract a lot of attention from everyone who visits the place; professional bird watchers, locals and tourists as well, who, like the birds, return each year to enjoy the amazing and unique surroundings that Las Salinas offers. This large salt water lagoon also has various wooden walkways that were installed fairly recently, and they give real close up access to be able to see the birds, without having any effect on the habitat or the precious eco system. Apart from the flamingos there is also ample opportunity to spot a wide variety of different species of birds, marine life and animals, all of which make Las Salinas their home. You can get a good idea of the location of the lagoon, in relation to the town, by this photo below. 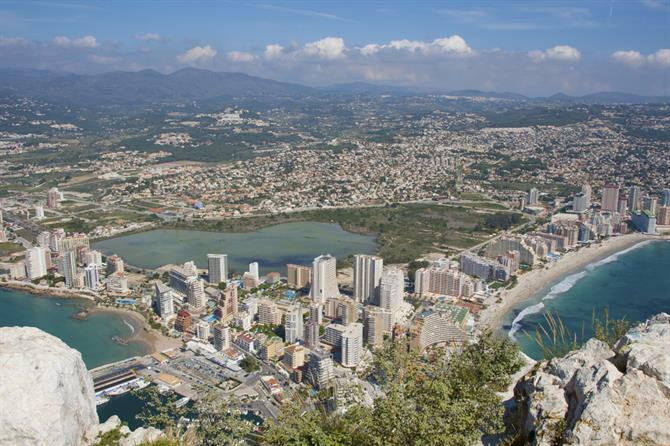 It’s easily accessible on foot from the main town centre and the main tourist areas, which is very handy if you are staying in Calpe as there is so much to do here! Far more than just salt. Salt has been harvested here in the lagoon for centuries and, up until recent times, was a very important source of income for the locals. This was augmented with a strong and established fishing industry, before the whole area along this coast was opened to tourism, and the area changed to what can be seen today. There is although far more to the park than just the birds, and it is a great place to really connect with nature, to relax, have a family picnic and just enjoy the peace and quiet, under the beautiful Spanish sunshine! We hope that you become one of the multitude of tourists and visitors to Calpe who will enjoy the Las Salinas natural park first hand, however this is a fragile and delicate natural environment and it is advisable to take any litter home with you and also to not disturb the birds or any of the plant life that exists here. To get here, take the AP-7 (toll) motorway and take Salida (exit) 63 which is clearly signposted “Benissa/Calpe”. Then take the N-332 towards Calpe which should be only about around 8 km. Calpe is a wonderful place to spend a holiday.